The oversized cardigan is gorgeous. Oh, really an eye catcher! Everything cool till the last detail. I love her look, great capture!!!! Oh I love Korean street fashion! So colorful!! Her cardi is supercool. Wow, hippy yet modern. Timeless look! So many colors, love it! Creatively put together, I kinda like this. WOW cool! i like every single piece of her outfit! You would think that the overflow of patterns may have made the overall look messy, but it actually played out perfectly. Great shot there, Scott! I love the mix of colors, except for the skirt. It just seems a tad wild for the already colorful ensemble. I adore the oversized sweater the most though. It looks so warm and comfy! I have that cardigan! And I thought I was the only one…she looks great! ohoho you went to Korea again?! anyways, her ability of layering patterns are intelligent! so great!! Cool outfit. She definitely knows how to mix patterns. how about making the Sartorialist 2 ! Probably the coolest girl in the world. Wow! I love her style. The cardi is awesome and the skirt is really eyecatching! okay – just because you took a picture of it doesn't make it fashionable. She seems to be a Japanese or Chinese tourist, carrying a travel guide in her hand. Guess the weather got warmer in Seoul finally! A beautiful shot. mixed prints can only be done by experts, she is a genius. Flip it, Mix it, Technicolor. Just amazing!! supper nice outfit!! love the colors!! LOVE this! The sweater is amazing and that skirt is gorgeous!!! Like the comment that this looks nomadic in a sense. It does have a tribal sense. This is one of the best street style pics you have ever posted. This is exactly the kind of projection I would expect from youth that grew up on over stimulation of video games, tv, movies and electronic music. Luv the skirt – don't remember seeing anything quite like it (reminds me a bit of Polish paper-cut patterns). Don't know where you found her – lived one year in Korea and got very very tired with the monotony of styles – rarely anybody stood out, or had an original style. But like sb noticed, she doesn't seem Korean – from the style and face she reminds me of Japanese. Que bien , viajar tanto y poder disfrutar de todo lo bueno, incluido los looks que puedes ver, la rebeca me gusta, aunque con la falda…me parece demasiado grunge. absolutely love this outfit…perfect mix…great!!!!! Wow! So eclectic, I love it. Love the capture…the outfit…not so much. But I like that fact that she has the balls to wear this and looks like she could care less what any of us think….good, bad or indifferent. Very aloof attitude you caught! So exciting. It's like she was coming down from another world. It's almost completely fabulous. The skirt needs to be solid or have a less obnoxious pattern. Otherwise, I love every element. AWESOME! RAD! THE SHOES ADD THAT PERFECT DASH OF RED AND THE BOTTOM FINISHING OF THIS CRAZY OUTFIT! I don't think it would have worked as well if the shoes were black, ya know? I think you should stay in Korea..
And let the large men in Europe who wear their clothes to tight have their ego's cool off for a while. And those anorexic socialites can go eat. Sartorialist in Korea should be a permanent fix! I would wear the cardigan.Too much colors on her clothes but for grey days in the winter it gives hope. I would never wear this, however, she pulled the look amazing and made me think I could maybe wear it. That's amazing! cannot tell u how badly i want that look in my closet right now!!! wondering why one sneaker is tied round the back of her ankle..and the other is tied the regular way. kind of a 1968..1969 vibe going on. Ohhh this look is so beautiful. Love all the combination of textures and colors of a very good taste. TT's Attic – Edgy, Affordable Fashion! Love it! So nice to see more Korean street fashion! i could never pull of the loose fitting cardigan but love the print as wel as the central asian looking and psychadelic kashmiri type print of her skirt. she definitely pulls off the look. i think it's her confidence and un-pretentiousness. most of us tend to be so finicky about this not matching with that or that not matching with this. like a few other people said, i too agree that she's most probably japanese based on her facial features(weird u might say but over the years, i've come to differentiate between asian faces) as well as the tour book in her hand. there are many japanese tourists that visit neighboring Korea. amazing! love the colour combi that is randomly put together! stunning! Asian eccentricity and style done perfectly. Now this is style taken to its extreme and it works! Good on her! Spectacular. The top is great, everything is great although I'd only give her 9/10 because of her wacky skirt. This walking eclectic heap of clothing and accessories is what I keep referring to as "Hippie gone wrong" Too bad because I know she's really trying to own this look, but she's got way too much going on here. The shoes are bad and there's no justification for them as far as lending validity to her pieces of choice. Ironically, the rest of the pieces, save boring messenger bag, all stand out on their own and are beautiful! The colors are just not working well with each other. I do say "Go for it girl" boldness and guts wise. But in the end her ensemble is a bomb! I do love her regal posture. Harajuku Fruits goes to college. She put some thought into this. Look at how she ties her sneakers, one round the back and one in front. Put your hand on the screen, cover the skirt and imagine this with jeans. Boring and matchy. I wish I'd had the imagination to dress like this in college. YES!!!! yeah for Seoul!!! Stay there and shoot your heart out! (I mean that camera wise). Really sick of the redundant european men with tight high water pants and something lumberjacky..very sick of androgynous women…Korea is where its at right now…very fresh. Made me smile on a gray day in TN – beautiful, bright colors and I love the high-tops! I think she looks rad. I love the red sneakers (converse) and the oversized sweater. Also the pattern clash is wonderful. I think pulling off a look like this needs a lot of black. I love how everything looks random, and yet, everything is pulled together by similar colors, lines, etc. The small details like the shoelaces and the leather gloves are also very cool and confident. The careless air about her makes me wonder if she really thought about the combination. Of course, the idea that it all works unintentionally makes it that much more intriguing. Unbelievable colors! What an inspiration!!!! Everything about this is beautiful! Love the different patterns and shapes and colours and cuts. 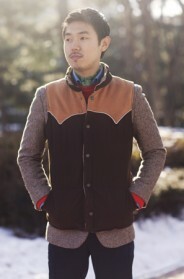 It's interesting how the ethnic/vintage look is finally being incorporated into Korean fashion now. It reminds me of something you would have been seen in the late 90's in Harajuku or Osaka. Love! Anyone know how to get my hands on that sweater? LOL. Great look! Love the mixing of the various patterns in her outfit and how it contrasts her perfectly pale complexion. She looks like an urban geisha! Love the mix of color and texture. It all carries thru. Kim was visiting Seoul with her dance group and wanted to see the city she had only been to once before. Comfort and warmth were key as she took her map and began to walk,killing time until her night time performance. I love that it looks so casual, like she put no thoughts into it at all. oh!this is something really amazing! I'm with the previous commentator who loves the over-sized cardigan…easy to sew if you know how to sew knits. I love this. Brianne's absolutely right–there's a deep, almost subliminal harmony in the lines and colors that makes everything work together. (E.g., the way the flare of the skirt echos the drape of the sweater…) And the elements, unrelated as they seem, come together to form a portrait of the wearer's vision of herself. As a trial fusion dancer, I completely "get" this one (though the idea of wearing this much color makes me twitchy!). The cardi/scarf combination is fantastic. different parts of her outfit represents different culture-fashion. L O V E I T !!!!!! In her own world all the way. textures, patterns, colours. Beautiful colours. I love the oversized cardi over the contrasting maxi! It just works. The over accessorizing is great, you can never have enough! Lovely match of patterns. Love it. I've never really looked at street styles whenever I went to Korea and now, I think I should! Thank you for taking such lovely pictures of Korean style. She doesn't look Korean at all to me. Seems like she's heavily influenced by Japanese style or actually is a Japanese. I cannot agree more with the comment that there are too many colors already despite the gorgeous oversized cardigan. I love all the bold colors. I also love the chuck taylors. Notice the one shoelace tied behind her converse…very eccentric cool. I'm loving it all, the patterns, textures and colors. This look says effortless cool comfort. she isn't korean because hold a guide book in her's hand. also, at this place a lot of japanes tourist. As several other posters have noted, she is definitely not Korean. Even without the guidebook in hand she would stand out as a tourist. I've lived here for six months and never seen anyone this bold, colorful, or whimsical. Korean style is a testament to the fact that they never had the sixties, and didn't have a counter-cultural renaissance in the 90s like Japan. As a result, style here looks very restrained, even tight, and always polished. my first debut single is out in Korea hope you can check it out sometimes! for everyone who thinks style means a 6 inch heel and something out of French Vouge, i present…this AH-mazing photo! she's so comfortable with herself and goes for it 100%. THAT is style :) love. The mix of colors and patterns and the serious look on her face make for an interesting photograph. Great contrast! This has to be in the next book!!! O wow, this is amazing. I love the way that she put this outfit together, it is so impeccably Korean. I love the adverse way of dressing from what we see over here in the USA. She might be Japanese, based on the tourist guide book, but she obviously has great taste b/c she came to visit Korea. :P The only thing even remotely "Korean" about this outfit (and it's not even Korean) are the Chuck Taylors. They're EVERYWHERE in Korea worn by all the young kids. Oh, and I JUST noticed her leather black gloves. This outfit is totally wacky, but it works somehow! this is love. her outfit is so good on so many levels and for so many reasons. so inspiring! This is Seoul, but she is Japanese.. What the? loveee all the textures, colors and patterns. Unexpected combinations and great colours. She looks great! digging all the craziness and colours in this one photo! How great to get to see how differently people do things the world over, instead of just the fash-pack brigade – thank you Sart – keep travelling! wow this is AMAZING! it might be one my favorite shots from you! i want to go there so bad. I lvoe the mix of colors, the pattern ont he skirt and the otufit…amaziong! So much color, very nice! Funny how even her map picks up the colours in her look! Very interesting, I sense a man repeller! takes a serene face like hers to carry the look. absolutely fabulous! Yay-the Sartorialist is in Seoul! I was there last summer and the city was filled with young people with great, dressed-up style. love it. nice nice nice. Wow, love the mix of color! I have seen me wearing cardigans like this, where can i get one here in Los Angeles. They look great and are popular amongst the Koreans. There are fair iles ish and colorful, i really want one. Someone please help me figuer out how to buy one. Thanks alot fellow Sarts! My guess is she is traveling and the cardigan is for warmth. Her outfit beneath is very well co ordinated with the exception of the green bag. The look is fun, and her expressions so serene above such a vibrant collection of color. damn! i really should have bought that Bbon-J cardigan when I had the chance! its great! She looks cool. I like everything, even her haircut and headphones makes her look cool. Her style seems very eclectic, more Japanese than Korean, but that style is becoming more and more popular in Korea. Ethno-Chic! Love the color.. and how there are no co-ordinates, and that's what creates the interest to look twice! Interesting! this is my most favorite outfit you have ever posted. LOVE LOVE LOVE!!!!! love this outfit, so colorful! Isn't she from Japan? The book she is holding is a travel guide I think. ^she could be, but shes wearing korean clothes. the cardigan is from Bbon-J, a Korean label. This may be my favorite combination ever. It just works. gorgeous. Traveling to India made me really appreciate color…it opens your eyes towards happiness. It seems like "most" people get insecure about color and shy away from it…afraid of what it will do to those around you or yourself…I say let them talk-let some light shine into their sad gray, black, brown cookie cutter style/personality. So liberating…. The cardigan is from NastyGal. It is an online website located in California…small world. Brilliant! Modern nomadic. Urban tribal. To me this ensemble qualifies as art. Very intelligently put together, and she is about 1 in 10 people in the world who could carry it off. Congratulations, my dear…..you are very talented. And thank you, Sartorialist……great shot! Oh!good~~~ Very coloful and unique! Maybe one from other place for tour, I guess! Cause the tour guide book in her hand ^^ Welcome to KOREA !!! oh wow, the cardigan, the textures, the colours, even the gloves, beautiful! TOTALLY INSPIRED!! Korea I can't wait to visit YOU! This shouldn`t work, but it does – bigtime! Amazing… this works so well on her. I love this beautiful creative outfit! Hi, I notice lots of people guessing where she's from. Actually, I know her personally and she's from Taiwan. Hope that helps! I've been disappointed with the style here in Seoul, actually… I'm eager to see what catches your eye! wow, she's incredible. A lot going on, but it looks so effortless at the same time. Makes me want to add a bit of colour to my wardrobe. To me, a Korean guy, she looks 100% a Japanese. No doubts on this. so many colors and patterns but she makes them work in a mysterious way! great photo. I wonder what you were doing in Korea? i'm going in a few months and can't wait to see all that great fashion and such! it's been over ten years! I have the same cardigan where I bought in Shanghai in feb. and I shocked because the cardigan is sold so many online shops in korea. Flawless look and attitude….Bravo !! Wow! She looks amazing! And the thing I like the most is that I am pretty sure she bought her skirt in Mexico! All that patterns, the bird, the colours, definitely handmade in Mexico. I love how she mixed all her clothes that well to make her look so unique! Fantastic use of patterns and that military color bag. Her outfit seems more Japanese style than Korean's. But it still looks cool to me! Like her oversized cardigan! hey, satorialist! did you talk to her before or after taking this picture? does she even know her picture is up here? she is missing all the fame as a fashionista! she is definately unique no matter where she is from. the guide book she is holding is called 'the beetle map'. it is written in english and japanese but anyone can use it. great for locals, too. This is a popular 'Mary' look in Seoul from a popular Korean drama 'Mary' played by Geun-young Moon last winter. You usually see this around Hong-Dae(Hongik University). This is not a typical look you see on locals around Cheongdam-dong, Apgujeong-dong or Shinsa-dong, where Dosan park is. this cardigan must have been produced in some crazy mass quantities and shipped all over the world. It even made it to South Africa. Saw it a shop here last week. I’m a Korean, live in Seoul. She is not Korean but Japanese(I think…), to touring. she got the mapbook in her hand^^ and her morphology is very “exotic” !! In Korea, we can see very many many Japanese to touring. Japanese love colorful fashion more than Korean. I’m not sure she’s Korean- may be Japanese. I think the brochure in her right hand is the guide book for Japanese tourists. which means that she might be just a Japanese tourist holding a guide book. coool. but I guess she`s japanese. I`m sure. on her right hand, tour guide book is. I love your picture, biggest fan in korea. wow im korean and never seen that kinda fashion. too much but gorgeous. Anyway she doesnt look like korean. More like a japanese. The Sartorialist in Seoul, South Korea!